I had my credit card ready and started checking steam winter sales. I had couple of games I wanted to buy now that they were on discount: Arma 3 and Ultimate General Civil War. I haven't tried them yet and actually haven't even installed Arma 3 yet. 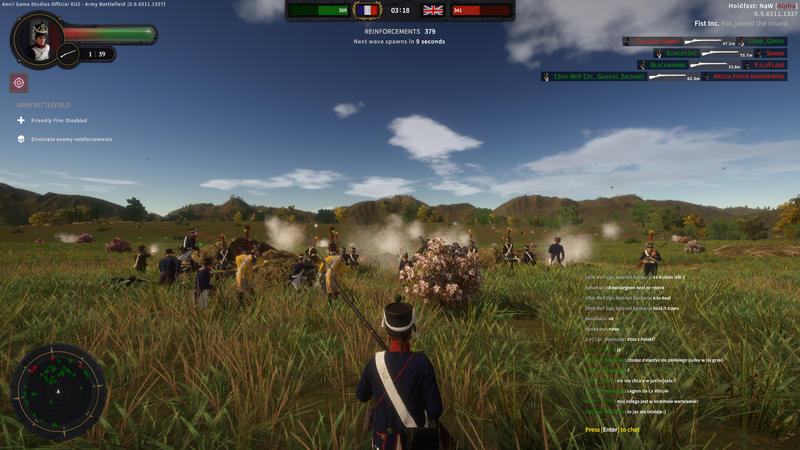 American Civil War strategy game interests me and that era of fighting, but on the steam sales I found another intriguing game: Holdfast Nations at War. 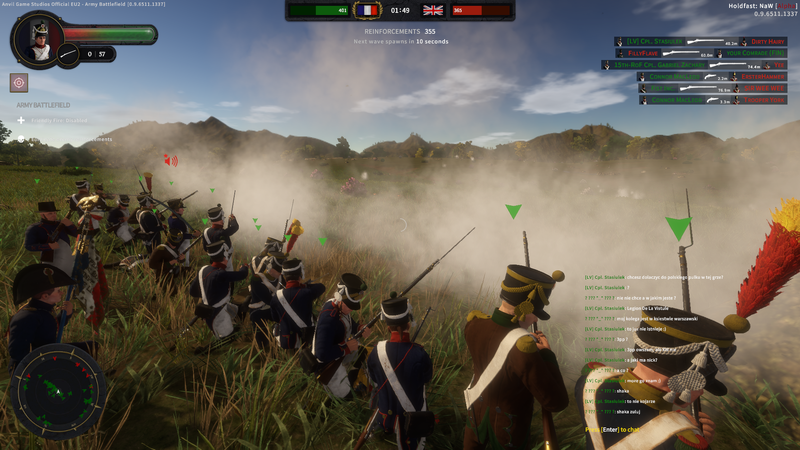 This game takes me to Napoleonic battlefield and promises great fun and meaningless death while marching across the field. "To the time-machine!" I spawn as a French infantryman into a battle. I'm wearing blue, enemy red, this should be easy. I see my fellow countrymen marching towards a an officer who's waving the flag. I hear distant shots and smoke. The field is open and barely has any bushes or rocks where to find cover. "Idle would call this a paradise", I noted. I kept walking forward and I found twenty Frenchmen holding a line behind some rocks. I decided to join their ranks. One Frenchman, a young officer, tried to give us orders, but his authority was not convincing and those musket balls flying overhead sounded deadly. I felt being behind a comfy rock was the best choice. Soon more and more infantrymen arrived to fill the gaps and our line was getting stronger. Drummer and flute joined so we had encouraging Marseilles to keep our patriotism alive. "English pig dogs!" Enemy was coming over the ridge, their formation wasn't even straight and that made me laugh. "Here they come, fire at will! ", our officer shouted. I waited for the English to come closer, aimed and my musket's barrel was following one redcoat. I fired...so much smoke... and apparently missed. I panicked and started to reload and it took ages. English were now charging and I was still ramming that damn musket-ball in. English officer with his sword was already in striking distance. My comrade shot him and I was saved. I decided to retreat from the rocks while my musket was still being reload. "Oui! Finally I have my gun reloaded! ", I rejoiced and fired "Merde! Missed again". "Take our position back! Form a line!" Our officer was shouting. We had repelled the attack, but they would definitely come again. This time our officer ordered with more confidence: "Form a line form a line quicly to my left!" I had to obey those orders, I could not resist and yes that excellent flute-playing inspired me. We had a nice French firing line ready and enemy was soon here again. Everyone was crouching to my left, but this one veteran from 1812 campaign was cursing: "You call this a straight line? Stand up and fight like a man!". I stood up and waited. Enemy was about to charge again, I saw some red disgusting English. They were frightened when they saw our excellent line. Their charge slowed down to a halt and they started to shoot our ranks. Their officers kept ordering them to move forward, but the coward English pig dogs found comfort from bushes or ran back to their mothers. "Gentlemen, present your arms... aim... fire!" A roaring volley of shots cut the English advance. "Reload! Fire at will! ", our officer ordered. Then suddenly I collapsed and felt pain in my chest: "Oh, Mon Dieu! I'm shot... Vive la Flance"
That rock I was telling. It was the culmination point of this battle. If we would lose it, Napoleon would be furious! Our excellent firing line. Veterans on my right stand like Frenchmen. Man that smoke is dense!